A column that gives you an opportunity to share your ideas with the community. 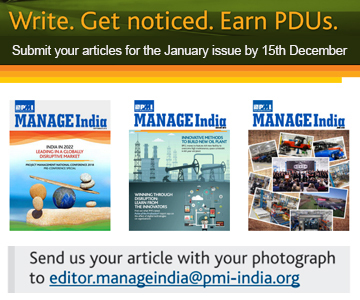 Take part in the contest and win PMI goodies. The contest has been closed on 15 December which was the last date of submission. Check out the space to know about the Winning Entry. Q. WHAT IS THE BIGGEST DISRUPTION THAT YOU ARE EXPERIENCING AT THE WORKPLACE? HOW ARE YOU PREPARING YOURSELF FOR IT?? A. Knowledge is Power!!! In today's ever evolving landscape, it’s more of a norm to re-invent yourself if not daily. With world class resources at your fingertips & at affordably costs, one has to upskill to be relevant. With massive open online courses (MOOC) like Coursera,Edx,Khan academy or Masterclasses.com you can even learn directly from folks like Malcolm Gladwell or Garry Kasparov. Wow!!! And with Mobile Apps like Blinkist you can read or listen to a complete book in just 15 minutes. As it said,one way to get better is to surround yourself with better people, well better people in this case could be Gen Z. The most effective way of learning is from Gen Z kiddos. These are those who know much more than you know or can even work way faster than you think. The key to upskill depends on how well one can engage these Gen Z in your projects or at an organization level. Open house discussions are a great way to engage them. So, to be relevant in today's workplace, enrol Gen Z folks are on your projects, enrol for a MOOC or just Blinkist.